Lose That Old Worn Insulation! Are you looking for a professional attic insulation removal service? If you worry you might be losing money on utility bills due to missing, worn or old insulation in your attic, why not have it re-insulated with us? At Attic Cleaning Hayward we have the equipment, knowledge, and experience to get rid of your old attic insulation and install a new, more efficient material that will keep the heat in and make you proud of your attic. By leaving the old insulation in your attic, you allow for a surge in your utility bills, poor indoor air quality, drafts, and other concerns. Pests such as mice and rats love making a home out of old insulations, meaning your old insulation might be providing a rent-free nesting place for rodents as you read these very lines. 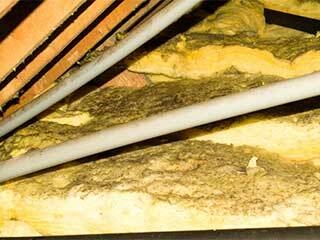 Getting the old, infested insulation out of your home can be a daunting task. Not only is it quite a difficult process, it can also lead to potential health concerns, as contaminants are easily spread throughout the air if the material is mishandled. Inhaling the infected air can lead to a range of respiratory issues, especially in those who are particularly prone to such diseases. If you are experiencing mold growth, water damage or rodent infestation in your attic, removing the old insulation is essential for safety and efficiency of your home, not to mention the health of your family. A new, clean insulation reduces energy bills and provides a safer, more temperature-balanced home. The last thing you want is poor indoor air quality of your home. That’s why it’s always a wise idea to hire a professional to handle the process in a safe and efficient manner. Our professionals have years of experience under their belts and the correct equipment that is necessary for the job. With us, your attic insulation is in safe hands. Contact us for more information any time!